Richard has been designing jewelry for almost a decade and is inspired by his life experiences, family, and his Christianity. Richard has a passion for the beauty of Texas and the great Southwest. He has kept his roots in La Grange, Texas, but loves the Southwest and spends as much time as possible in Santa Fe and southern Colorado. After a visit to Santa Fe or northern New Mexico, Richard is always anxious to create new jewelry, being inspired by the incredible sunsets, crisp, light air, and the rolling plains to the mountains. Richard is also inspired by the beautiful hill country where the rolling hills have blots of green cedar against the dry rocky soil. Along with Richard's love of the great Southwest, he has a special interest in the unique history and styles of Mexico. Richard has collected pottery and kachinas since the late 1980s and also began collecting Mexican retablos in the mid 1980s. The Christian history and primitive style of the retablos are definitely influences on the jewelry that Richard creates. The majority of Richard's pieces are one-of-a-kind, each hand crafted individually by the artist himself. 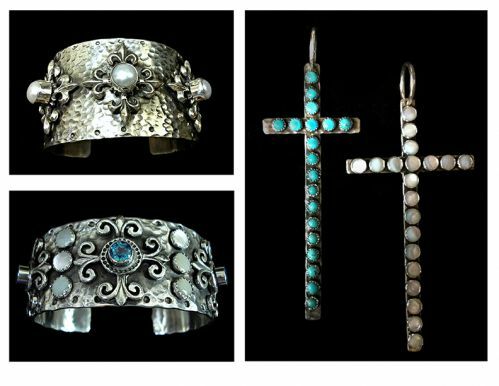 He often incorporates crosses, images of the Virgin Mary, as well as a line of "Dia De Los Meurtos" pieces in his works, mixing rugged turquoise with the brilliance of gemstones, hammered sterling silver with yellow gold for a unique contrast. Richard loves what he does and he will tell you that he is very fortunate and blessed to be able to create jewelry as his full time job. "Designing and making jewelry is truly my passion. I put my heart and soul into each piece," Richard says. Richard is a fourth generation La Grange, Fayette County Texan, born and raised in La Grange, Texas. He graduated from La Grange High School and then attended college at Texas State University in San Marcos, Texas. Richard graduated in 1983 with a major in Geography and a minor in Art. Richard took many precious metals classes while in college, which really sparked his interest in jewelry. Although Richard will tell you that most of what he knows is self taught, usual by trial and error. After college, Richard moved to Austin, Texas, where he met his wife Janet and started a family. Richard's family soon moved to Colorado, residing in Denver, then Colorado Springs where Richard worked in a retail business. Richard and his family then moved to El Paso, Texas, but Richard wanted to raise his family in his hometown. Richard's family then moved back to La Grange in 1995, where he was able to reintroduce himself to jewelry repair and design. "We enjoyed living in all of these places," Richard says, "but we wanted to raise our family in La Grange. We wouldn't trade living in La Grange for anything. We absolutely love it here." 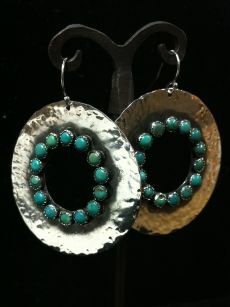 Richard began his business with jewelry repairs, but eventually started creating his own jewelry designs in 2000. This was the beginning of Richards distinctive style that can now be found throughout his collection, Richard Schmidt Jewelry Design. Numerous articles have been written about his work in national magazines like Cowboys & Indians, Cactus Creek Daily, Show Daily, Southern Living, and Women Out West. 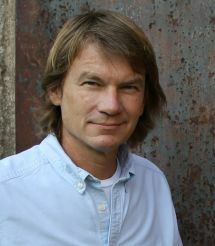 His work is worn by several T.V. celebrities including Meredith Fiero, Matt Lauer and Cathy Lee Gifford as well as musicians like Steven Tyler of Aerosmith. Richard's handmade jewelry can be found in over 35 stores and galleries in approximately 10 states across the U.S. and also in his permanent gallery at Schmidt's in La Grange, located "on the square" at 118 North Washington Street. Richard currently resides in the La Grange, Texas with his wife Janet and their children Tyler and Lauren.